ALLEGRA BOVERMAN/Staff photo. Gloucester Daily Times. 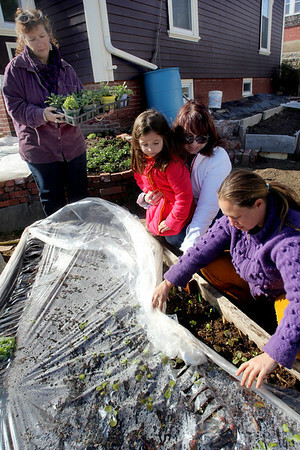 Gloucester: Lara Lepionka, lower right, of The Cape Ann Farmers Markets Backyard Growers Program, with members Antoinetta and her mother Randi Vila, center, examining the raised beds at Lepionka's house on Monday. Member Robyn McNair is at upper left. The organization will hold the second of two garden trainings this Saturday, March 31, from 9:30 to 11:30 a.m. at the Open Door, 29 Emerson Ave., (rear entrance).